Your sleep is vital to your physical and mental health. At HowSleepWorks, we want to help you understand not only the importance of sleep but how it works. Your sleep can affect your work performance, your mental health, your mood and much more. Here at HowSleepWorks, we aim to provide information on sleep and be the number one source on the internet for everything sleep related. Are you getting enough sleep at night? We have a sleep calculator to help determine the proper amount of sleep you should be getting and what time you should be going to bed. Sleep is a complicated process and still not everything is known about it. There are different stages of sleep and there’s different cycles your body goes through while you sleep. Our Sleep Types & Stages page goes into detail about each of these stages. We also understand how hard falling asleep can be. It can feel like you’re not tired and it may feel difficult to fall asleep. There are some simple and effective ways to help you fall asleep even if you don’t feel tired. We share 25 ways to quickly fall asleep, for even the most stubborn sleepers. Do you have a sleeping disorder? We’re committed to providing up to date information on issues like insomnia, restless leg syndrome, sleep apnea, narcolepsy, hypersomnia, circadian rhythm sleep disorders, parasomnias and more sleep conditions. We go over every single disorder in detail and talk about what you can do about it. HowSleepWorks isn’t just about falling asleep, we also want you to sleep better. So, when you do finally get to sleep, you get the best sleep possible. On our Solve Sleep Problems Using Science page, we’ll give you detailed advice on how to achieve far better quality of sleep. HowSleepWorks is devoted to everything sleep and to help you get the most of it. Please remember that this website shouldn’t be used as a professional consultation and all the information presented here is for educational purposes only. You should always consult a medical professional to properly diagnose and treat sleep disorders. English by birth and Canadian by choice. Starting out with an education in accounting and not being happy with the line of work, Luke decided to leave that live behind and work for himself, doing various charity work along the way. Luke has done a lot of travelling and started to take up an interest in websites after his daughter was born in 1995. He completed his first website in 1998, which remains unchanged and updated to this day for sentimental reasons. Douglas is one of our most qualified sleep experts, with training and education majors in human anatomy, human physiology and neuroscience. Douglas graduated from the University of Melbourne with a degree in Bachelors in Science. Douglas has a long history of sleep science and education. Douglas got his start in sleep science by working as a receptionist in the Sleep and Repiratory Specialist Clinic. From there, he moved up tobecome a Sleep Technologist. Finally, he completed his journey to become a Sleep Scientist. Douglas aims to provide helpful insight and education on sleep apnea. Robert is a guest blogger on HowSleepWorks and likes to blog as a hobby. Robert primarily specializes in the financial sector with over 10 years of experience. Robert focuses primarily on business startups, online marketing and has a personal love and passion for new technology related to sleep. Akshay is a passionate writer who seeks to not only help tell a story but also likes to help companies improve their branding efforts. Akshay has an artistic mindset that allows him to craft innovative ideas that help shape brands and tell an authentic story. Akshay has numerous years of experience freelance writing for some of the biggest brands including Forbes and PBS. Still have any question or would like to contact our team? 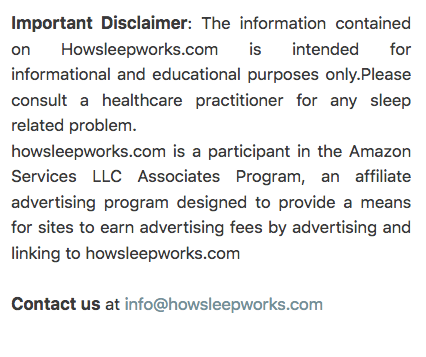 Please email us @ info(at)howsleepworks.com or use the below form.